The growth performance of catfish seed in earthen and concrete tank had been well documented. However, the challenges of shooters and economy of available space had changed the focus of fish seed producers to the use of hapas in both systems in recent times. This study therefore compares the growth performance and survival of catfish fry raised with and without hapa in indoor and outdoor concrete tanks. 2000 fry (0.13 ± 0.02 g) were introduced to each of indoor concrete tanks, outdoor concrete tanks (2.0 × 2.0 × 1.0 m) with and without hapas (0.7 × 0.7 × 0.35 m) respectively with three replicate. Commercial diet of 45% crude protein was administered four times daily in split-rations at 5% body weight for 70 days. Unconsumed feed were controlled by daily flow through. The specific growth rate, weight gain, total body length, and survival rate were determined weekly. The results showed a significant different in growth performance and survival of the fish between culture systems. Fish in indoor and outdoor hapas exhibited significantly higher weight (1.58 ± 0.06 and 1.50 ± 0.02 g) compared to indoor and outdoor concrete tanks (1.41 ± 0.02 and 1.22 ± 0.03g). Highest survival rate (78.50% ± 5.48%) was however, recorded in indoor concrete tank followed by (64.08 ± 0.73%) hapas in outdoor concrete tanks. The survival rate was not significantly different among hapa systems but significantly differ between concrete tanks and hapas. This study revealed that, rearing of C. gariepinus fry in hapas is considered better for seed production if the attainment of fast growth is considered. In Nigeria, the prominence of aquaculture as fish food source is growing in recent times while supply from capture fisheries is dwindling due to undue fishing pressure and climate change among other factors. African catfish, Clarias gariepinus, is the most popularly cultured fish in Nigeria (Sogbesan and Ugwumba, 2006). This species has drawn attention of aquaculturists because of its biological attributes that include faster growth rate, resistance to diseases and possibility of high stocking density (Saad et al. 2009). One prerequisite of intensive fish culture technology is to have healthy fish seed in the required quantities. In the last decade, spectacular growth has been recorded in Catfish fingerlings production through artificial propagation, despite this breakthrough, the demand for the seeds still outstrips the supply (Madu et al. 2003), notwithstanding the tenfold increase in production from 3 million/year in 2000 to 30 million in 2005, estimated at $2.32 million (AIFP, 2005) achieved. The shortfall in fish seed supply could be linked to inappropriate selection of the best culture medium for fry-fingerling interphase which remained intractable over the years. In an attempt to manage fry-fingerling stage effectively different culture systems are presently in use. Some of these include cage, pens, hapa, fibre tank, concrete tank, plastic tank, wooden trough, recirculating tank and earthen pond (Williams et al. 2008), but with varying level of success. In recent times, the challenges of shooters and economy of available space had changed the focus of fish seed producers to the use of hapas in concrete tank and earthen pond. A number of researches have confirmed concrete tanks as best in term of survivability (Olanrewaju et al. 2009; Akinwande et al. 2009; Edward et al. 2010). Similarly, Ahmed et al, 1997, Odedeyi, 2007, Agbebi et al. 2009 and Okunsebor et al. 2013 reported higher growth performance of seed in Hapa-in-tank. The blending of high survival rate and fast growth rate for catfish seed present better possibilities for meeting fish seed needs of the ever growing aquaculture industry in Nigeria. This study therefore, evaluates growth performance and survival of African catfish fry in concrete tanks with and without hapas. Hatchery raised fry obtained from hormonally-induced spawns of mature African catfish C. gariepinus broodstocks were used in this study. The initial mean standard length and weight of experimental fry were 1.6 ± 0.03 cm and 0.13 ± 0.02 g respectively. 2000 fry were introduced to each of the indoor concrete tanks, outdoor concrete tanks, hapas (0.7 × 0.7 × 0.35 m) fixed in indoor and outdoor concrete tanks (2.0 × 2.0 × 1.0 m) representing four treatments with three replications as treatments ICT (indoor concrete tanks), OCT (outdoor concrete tanks), HIC (hapa in indoor concrete tanks) and HOC (Hapas in outdoor concrete tank). The hapas were made of plankton net with long zip for conveniences of feeding as well as to protect the fish from getting out of the hapas. The experimental tanks were supplied with dechlorinated bore-hole water prior to the commencement of the experiment. Where, W2 and W1 represent–final and initial weight of fish; T1 and T2 represent–final and initial time (days); Loge represent–Natural log to base e (Adewolu et al. 2008). Percentage weight gian=(final weight-initial weight/initial weight)×100 (Odedeyi, 2007). Total body length=final length-initial weigth (Madu et al. 2003). The influence of different culture medium on growth and survival was analyzed using descriptive statistics, analysis of variance and Duncan’s multiple range tests P<0.05 level of confidence. The effect of treatments on growth performance of C. gariepinus fry is presented in Table 1. The highest weight gain (1.58 ± 0.06 g/fish) was obtained in treatment HIC, followed by treatment HOC (1.50 ± 0.02 g/fish) which significantly differ (P<0.05) from treatments OCT (1.22 ± 0.03 g/fish) and ICT ((1.41 ± 0.02 g/fish). This result reflects the findings of Okunsebor et al (2013) who reported that C. gariepinus fry reared in Hapa-intank exhibited significantly superior growth than concrete tank. Ahmed et al (1997) also reported comparatively higher growth performance in hapa-in-tank (5.99 g) than the glass tank (3.74 g). Similarly, Agbebi et al (2009) successfully raised Clariobranchus fry in Hapa-in-tank and observed better growth performance at different stocking density. However, the mean weight gain recorded in treatment HIC in this present study is higher than the findings of Olanrewaju et al. (2009) when C. gariepinus fry was raised in concrete tank. The best growth performance in hapas may be due to limited swimming space which may enhance better accessibility to feed and less energy loss due to swimming and invariably better growth. Thus, the adoption of hapa for raising of C. gariepinus fry could enhance growth. The mean body length at the end of 70 days growth trial gave no significant difference (P>0.05) among treatments. This result was similar to the findings of Okunsebor et al (2013) who reported no significant difference between fry reared in glass tank and hapa-in-tank. Conversely, Ahmed et al. (1997) reported significantly higher mean body length in C. gariepinus fry raised in hapa-in-tank when compared with concrete tank. For specific growth rate, the highest value (3.49 ± 0.20) was obtained in treatment HIC while the least value (2.96 ± 0.21) was recorded in treatment OCT. There is no significant difference (P>0.05) in SGR among treatments as indicated in Table 1. This is in agreement with the findings of Alhassan et al. (2012) who recorded no significant difference in SGR when Oreochromis niloticus fry was raised in concrete tank and hapa-in-tank. The highest percentage survival (78.50 ± 5.48%) was however observed in treatment ICT followed by treatment HOC (64.08 ± 0.73 %) while least survival (52.33±2.02%) was noticed in treatment OCT (Figure 1). There is a significant difference (P>0.05) for survival rate among treatments. Interestingly, no significant variation (P>0.05) exists in percentage survival between treatment HIC and HOC. This observation corroborates the work of Olanrewaju et al. (2009) that studied growth performance of Dutch clarias fry/ fingerlings in indoor concrete tank and reported higher survival rate of between 83%-92.5%. Also, Akinwande et al. (2009) recorded higher survival rate of 85% - 90% for Heterobranchus species and their hybrid in indoor concrete tanks. Table 1: Effect of treatments on growth performance of C. gariepinus fry (Mean ± SE). 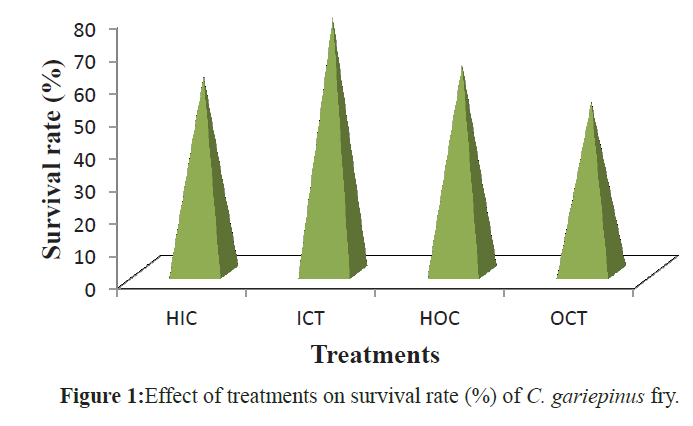 Figure 1: Effect of treatments on survival rate (%) of C. gariepinus fry. Table 2 shows the mean water quality parameters recorded during the study. The water quality was within the optimal range for the growth of C. gariepinus fry as reported by Omitoyin (2007). Table 2: Overall mean values of water quality parameters during the period of study (Mean ± SE). Information obtained from this study revealed that the growth and survival of C. gariepinus fry significantly differ between systems. The hapa remain the optimum medium for enhanced growth of C. gariepinus fry while the survival was highest in indoor concrete tanks. Considering the results of this study, rearing of C. gariepinus fry in hapas is considered as the ideal method for seed production if the target is to attain fast growth. Agbebi, O.,Ajagbe O.,Makinde, L. andAfolabi, O. 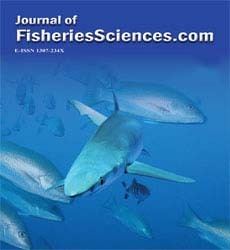 (2009).Production, Growth and Effect of Varying Stocking Density of ClariobranchusFry.Journal of Fisheries International, 4(4), 73-78. Aquaculture and Inland Fisheries Project (AIFP) (2005). Farming Nigeria’s waters.Technical note No. 16 of the Nigerian Special Programme for Food Security (NSPFS), 65 p.
Madu, C.T., Okwuegbo, C.C. and Madu, I.D. (2003).Optimum Dietary protein level for growth and gonadal maturation of female HeterobranchuslongifilisBroodstock.Journal of Aquatic Science.18(18): 29-34. Odedeyi, D. O. (2007). Survival and growth of hybrid (female) Clariasgariepinus (B) and male Heterobranchuslongifilis (val.) fingerlings: Effect of broodstock sizes American-Eurasian Journal of Scientific Research 2(1): 19-23. Okunsebor, S.A., Kigbu, A. and Shima, K.G. (2013).The use of hapa as an improved system for culturing of Clariasgariepinus fry. Proceeding of the 27th Annual Conference of the Fisheries Society of Nigeria (FISON) Topo-Badagry, Lagos, 25th – 29th October, 2010. Pp 102–105. Olanrewaju, A.N., Agbelege, O.O. and Ahmed, K.S. (2009): Growth and production of Dutch clarias fry/fingerlings in indoor tanks in arid zone.In: O. A. Fagbenro, E.O. Adeparusi, O. T. Adebayo, L. C. Nwanna, A. A. Dada, and M. O. Olufayo (eds.). Proceeding of the 24thAnnual Conference of the Fisheries Society of Nigeria (FISON) Akure, 26th – 28th October, 2009.Pp 108–110. Omitoyin, B.O. (2007). Introduction to fish farming in Nigeria. Ibadan University Press, University 0f Ibadan, Nigeria.90p. Saad, Y.M, ShadenHanafi, M., Essa, M.A., Guerges, A.A. and Fawzia Ali, S. (2009). Genetics signatures of some Egyptian Clariasgariepinus populations.Global Veterinaria, 3(6): 503-508. Sogbesan, O.A. and Ugwumba, A.A.A. (2006).Bionomics evaluations of garden snail (Limicolaria Aurora Jay) meat meal in the diet of Clariasgariepinus(Burchell) fingerlings.Nigeria J. of Fisheries, 2-3(2): 358-371. Williams, S.B., Olaosebikan, B.D., Adeleke, A.O.and Fagbenro, O.A. (2008).Status of African catfish farming in Nigeria. In Ponzoni, R.W. and N.H. Nguyen (eds).Proceedings of a Workshop on the Development of a Genetic Improvement Program for African Catfish Clariasgariepinus. Accra, Ghana, 5-9 November 2007. pp 49–56.